As World Breastfeeding Week wraps up, I wanted to take a minute to talk about the pollution of our environments. I don't just mean the greater, global environment, I mean the personal environments of each one us. The environments in which we live our lives, our homes, our work space, our schools, our vehicles, our stores, etc. I know in my mind, whenever I hear about pollution in the environment, I picture some place "away." The pollution of the oceans, the pollution of the rain forests, that sort of thing. I know it's bad and I do what I can to combat it, but still in my mind it's "away." So, when I read the study measuring toxic chemicals in breastmilk in the United States, I admit I panicked a little bit. I mean, of all the most wondrous, nutritious, magical foods I could nourish my baby with, I put breastmilk at the top. It's so freakin natural, after all! It's safety and purity were a given! If there was ever a time to yell, "Whiskey! Tango! Foxtrot!" this was it. Not only was I panicky about the babies I had nursed, but I was also panicky about my own breast health. Medscape reports that the "Lipophilic properties of certain chemicals allow these to be stored in the fat tissue of the breast for a long time." Many of these chemicals are known or suspected carcinogens. So, what's a girl to do? Do we throw up our hands and reach for the can of formula? Not so fast, there are plenty of contamination concerns with formula, too. These studies shouldn't be your reason to choose to bottle feed. Do we accept that this is just the way the world is these days? I don't think so. I'm just not that kind of girl. Because, here is the good news. When governments and communities act to ban some of these dangerous chemicals, the effects are radical and fast. Just look at the studies in Sweden. See?! There is hope. We just need that public outcry. 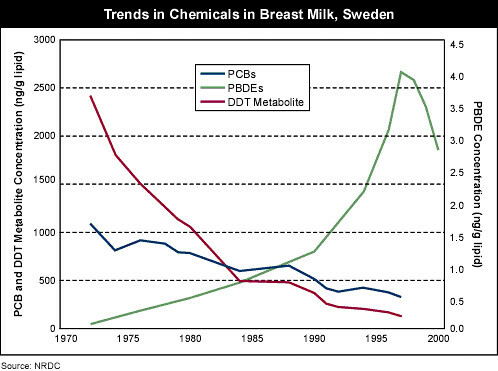 Environmental Working group also conducted a study of breastmilk and PBDEs. The results should inspire some public outcry. So, in honor of World Breastfeeding Week, please call your representatives and tell them you want them to support the Safe Chemicals Act of 2011. It's time. Should only breastfeeding mothers be alarmed? I don't think so. If ever there was a canary in the coalmine, this is it. What else can a breastfeeding mother do to minimize herr risk of exposure? Well, eat as much organic as she can, obviously. Reduce her exposure to flame retardants. But, in addition to the bioaccumulative and persistent toxins that were found in the breastmilk, there were also some more quickly metabolized chemicals including solvents and artificial fragrance ingredients. Avoiding products that contain these types of chemicals, may greatly reduce your baby's exposure not just in baby's home environment, but also in his primary food source. You know, you.